A large part of a tree trunk rests on somebody's roof. Those of us who live anywhere between Lipa and Sto. Tomas here in Batangas – give or take a few municipalities – will be a tad more appreciative if we are not already of the terror that must have engulfed those who had to sit out the passing of last November’s Super Typhoon Haiyan, a.k.a. Yolanda. Typhoon Glenda, which passed by early in the morning of last Wednesday, has got to be among the most terrifying to have crossed these parts in recent memory. Glenda – international code name Rammasun – stole into our neighbourhoods in the deep of the night, catching most of us probably off-guard. The previous night’s weather alerts pegged the typhoon as travelling at 19kph in the general direction of Metro Manila. It was, therefore, expected in the capital around midday. Because, in nautical terms, the metropolis is just a stone’s throw away from where we live, it would have been reasonable for those of us who stayed up for the late night news programs to have expected Glenda’s winds to commence at least when there was daylight already of Wednesday. But no; the winds started to blow – I am reasonably sure – past three in the morning. The sound of the winds blowing woke me up; so I got up to check my watch and take a pee. The damage must run into the millions, but even in the morning after the storm passed, people shook their heads despondently for a while but then quickly moved on to clean up and make repairs. That was why, in the neighbourhood, the soundtrack for the next two days was the sound of constant hammering as roofs and walls were quickly patched back on. The first half an hour was not too bad. Then it progressively became worse. When the outer fringes of Yolanda caught us last December, the winds were reasonably strong but there was hardly any rain. Glenda had both – rushing winds and torrential rains. I opened my jalousies to sneak a peak outside and the water immediately splattered onto my face through the glass panes of the window. Although it was dark, there was enough light even in the couple of seconds I had the jalousies open for me to make out the rains falling almost horizontally, blown as they were by the powerful winds. My neighbour’s house behind mine is just 25 metres or so away; but I could not even make its contour out in the almost solid wall of water that was cascading from the skies. The winds were already terrifying as they were; but the peak gusts, when they blew every few minutes, were something else altogether. They sounded like demons playing a game of tag in the dark and screaming past the house as they went round and round in eternal circles. I had cotton balls plugged into my ears to muffle the noise; but the sound of the gusts was still unnerving. When the peak winds blew, the entire house vibrated as though a huge truck was passing right next to it. And it went on and on. The seconds turned into minutes. The minutes turned into hours. It felt like it would never end. As the winds blew, there would be occasional clanking sounds as something blown by the winds fell on the roof; or a thudding sound from something heavy that just fell hard onto the ground outside. Most unnerving of all was the sound that branches made when they scraped against the roof of the house; or when metal clanked against metal as obviously roofing materials were being torn off all around the neighbourhood. In the dark, it was impossible to tell if the roofing being torn off was the neighbours’ or mine; and I cringed at the very thought of daylight shining through where my roof once was. There had been few moments in my life when I had been as petrified as I was when Glenda passed through; and when the trauma became almost unbearable, I picked up the rosary and started to pray. I did so out of despair, completing the mysteries and starting over after I did. I must have prayed for almost three hours, the repetitiveness of the rosary helping to calm my nerves until finally, exhausted, I managed to doze off again. When I roused later in the morning, the winds had already died down and the neighbours were already out inspecting their yards and looking grim. Yolanda was about a hundred kilometres per hour stronger than Glenda. God forbid that such a monster will ever pass this way. I thank God profusely for having seen me through Glenda; and will pray that I do not live to see anything stronger. Post by Rex Raymond Torrecampo. Glenda was not even supposed to pass our way. The initial forecasts tracks showed it going north and looking likely to follow practically the same route of the earlier Super-Typhoon Neoguri. That is, go north; just skirt the outer fringes of the Philippine Area of Responsibility before moving on to Taiwan and then either straight on to Mainland China or curving eastwards to Japan. A high pressure ridge north of the Philippines stalled Glenda’s northward progression, however, changing its track to due west. Unless the high pressure area eased, Glenda’s track would take it straight towards the Bicol Region. Most of the initial forecast models showed it skirting the eastern coast of the country and crossing Central Luzon. As it approached, the models continued to be revised taking into consideration all information being collected. The new models showed it making landfall somewhere in Bicol before moving north-northwest in the general direction of Metro Manila. This somewhat alarmed me because, despite all the technological advances in weather watching, tropical storms still continue to do their thing; and any slight deviation in Glenda’s track southwards would send it to Batangas. However, I was not overly worried because, as late as Tuesday afternoon, Glenda was a Category 1 typhoon with sustained winds of about 110kph and gusts of up to 150kph. We who live in the tropics along Typhoon Alley normally will think of such a storm as fairly innocuous. TV Patrol’s evening edition announced the same wind speeds, based on PAGASA’s 5pm weather bulletin. Glenda had apparently made landfall in the Legazpi area or thereabouts and under normal circumstances, its winds would have slowed down upon interaction with land. Apparently, Glenda was NOT going to be a normal typhoon. At about 9 o’clock Tuesday night, Typhoon2000.com – another reliable web site that I visit for storm updates – pegged Glenda with winds of 185kph. Now this was unusual. Glenda had strengthened instead of weakening. Meanwhile, at around the same time, the Twitter account of 28Storms.com announced that Glenda had intensified rapidly into a Category 4 typhoon. 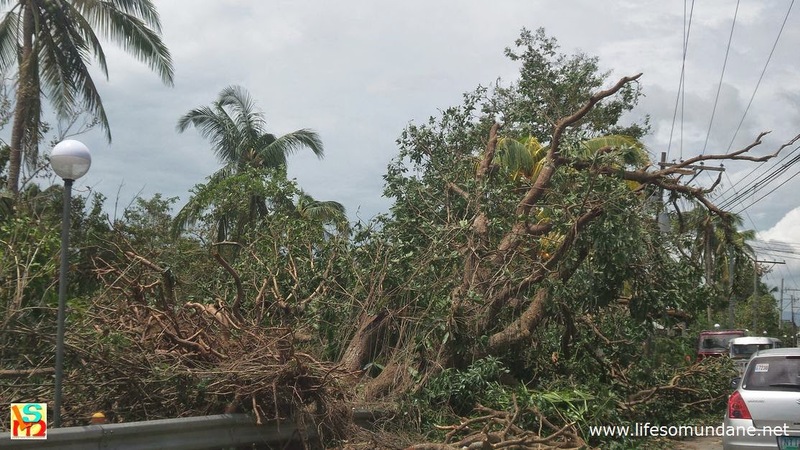 Based on the Saffir Simpson scale, a Category 4 carries winds from 210 to 249 kph. PAGASA’s last relevant announcement on Twitter before the typhoon actually hit said Glenda had winds from 101 to 185kph, mirroring the earlier update made by Typhoon2000.com. Of course, the power went out as soon as the winds started to blow menacingly. Working back when power was restored, a couple of things apparently happened while we slept. First, Glenda accelerated. Out in open sea when it was still developing, it was actually moving westward as much as 30kph or more. It slowed down nearing land, which was why estimates were made of it hitting Metro Manila around midday. It apparently picked up speed again once over land, which explains why it stole in like a thief in the early hours of the morning of Wednesday. Second, it did exactly as I had feared earlier; i.e. that it would deflect southwards from its forecast track. 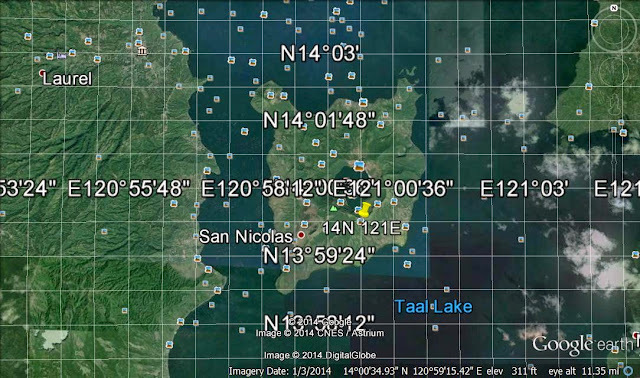 PAGASA’s 6:00am announcement placed its eye at 14N 121E or directly over the main volcano island inside Taal Lake. At 6:00am of 15 July, PAGASA announced the eye of Glenda at 14N 121 E which meant it was over the main Volcano Island of Taal Lake. 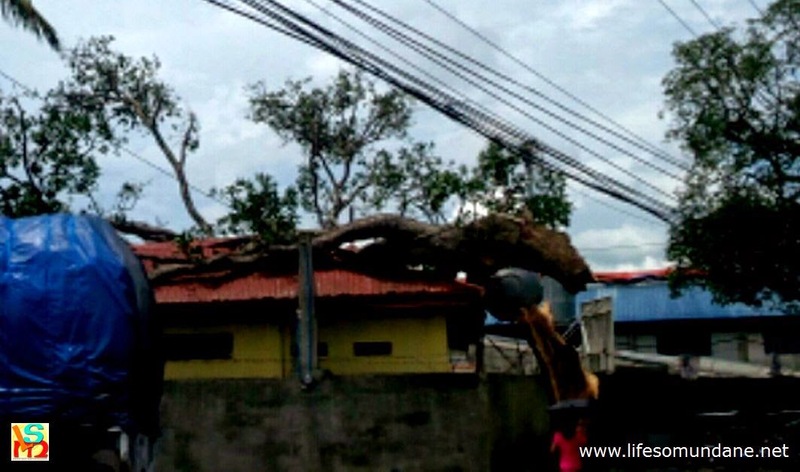 Lipa City was probably just outside the wall of the eye and therefore bore the typhoon's heaviest winds. I do not know the size of Glenda’s eye; but I suspect we here in Lipa were just outside it. In other words, we were feeling the typhoon’s most powerful winds. I do not care what PAGASA says about Glenda’s wind speeds. I swear to God those wind gusts were in excess of 200kph! In fact, the light of the morning brought some grim realities. Several houses in my own neighbourhood had their roofs torn off; and one right in front of mine had even the walls blown away. That my own house thankfully survived relatively unscathed is something I will eternally thank the good Lord for and why I have profound belief in the power of the rosary. People slag Batelec for all sorts of reasons, some fair and some unfair. But that the power came back on last night was something of a minor miracle that we all have to thank the cooperative for. Their crews had, I heard, been working round-the-clock to restore the service. Frankly, I was resigned to several more days in the dark. I had gone earlier yesterday to Cuenca with a friend and the damage was horrifying: cables ripped off, some dangling dangerously onto the roads; large trees uprooted; roofs of houses torn off. 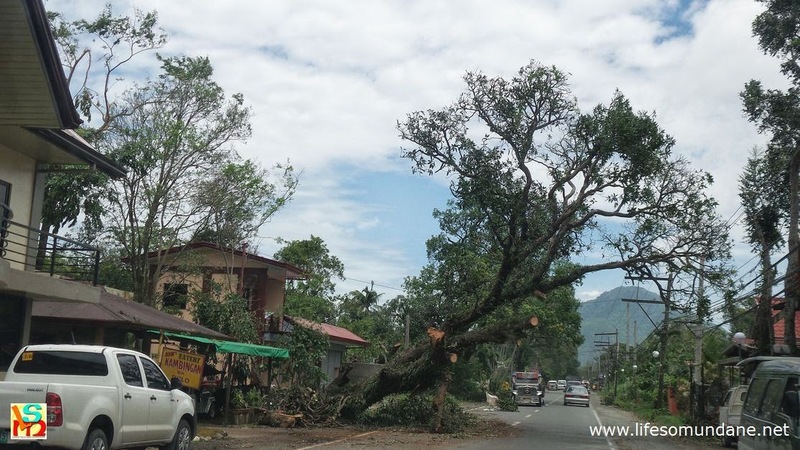 Knowing as I do that power served to Lipa comes through the cables along the road to Cuenca, I feared for the worst. I did a jig when the lights came back on last night! This tree leans dangerously close towards the road, with wires dangling from it. No tree was old or big enough for Glenda to uproot. This was along the road to Lemery. Going uptown Thursday, of course the mango trees lining the walls of Fernando Air Base had their branches torn off as they invariably do whenever a significant typhoon passes through. What was remarkable were the breaks along several points of the wall itself, the concrete apparently weakened by the rains and felled by the winds. The city itself was littered with branches, twigs and leaves. Some streets were dusty from sediment obviously deposited by floodwaters and dried when the sun came out. The damage must run into the millions, but even in the morning after the storm passed, people shook their heads despondently for a while but then quickly moved on to clean up and make repairs. That was why, in the neighbourhood, the soundtrack for the next two days was the constant hammering as roofs and walls were quickly patched back on. We Filipinos are a resilient lot, are we not? It helped that Glenda did not linger; and that even in the afternoon of the day when it passed, there was already grudging sunshine, making it almost difficult to imagine that the typhoon was wreaking havoc and sowing terror just hours earlier.